Teddy clothes and costumes can be fun and is often the main reason to dress your bear. But there are some other very good reasons for dressing your bears that could help to keep them in tip top condition for much longer. This page will highlight a few of the main reasons for dressing your bears. Fragility - Some may be fragile and the clothes help to keep them in one piece and reduce any further strain on the material. Baldness - As some bears age their fur may begin to fall out or perhaps they were loved rather a little too much and bald patches have appeared. Clothes will help to cover up any unsightly patches. Repair - Replacement plush or limbs may mean that the match between the old and new fur may not be exact. Clothes help to disguise these inconsistencies. Depending on the age of your bear you might want to find a teddy bear costume which reflects the period in history your bear was made in. 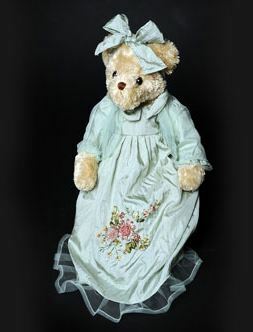 For instance a teddy made in the 1850's to 1900 would look great in a lovely Victorian dress or dapper suit from the period. 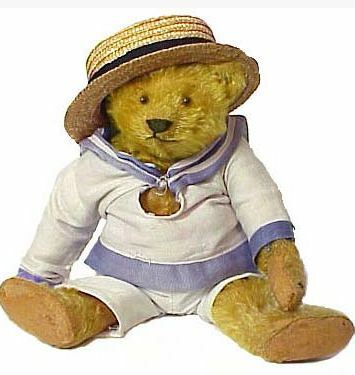 Perhaps you have a 1960's bear which would suit a flower power shirt or a crown of dried flowers. Whereas a 1970's bear might look simply dazzling in a glitter cat suit. The world of costumes can be as creative and as imaginative as you like and this is where the fun of dressing up your bears can be an unending pleasure. Many teddy bears are often made with their very own set of clothes. 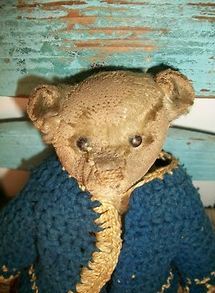 The most prized of these are of course original antique bears with their original clothes. Early on many clothes were handmade by their owners as sewing was much more popular than today, these clothes are also very sort after. Just like old bears, old clothes also need to be handled with care. Washing -If they are robust enough you can give them a gentle hand wash once in awhile using cold water and gentle detergent. Dusting - if the clothes are rather thin then your best option is to give the clothes a gentle brush with a soft brush once in awhile. Dust can build up on the clothes very quickly if they are not under cover and could in turn permanently discolour the garment.